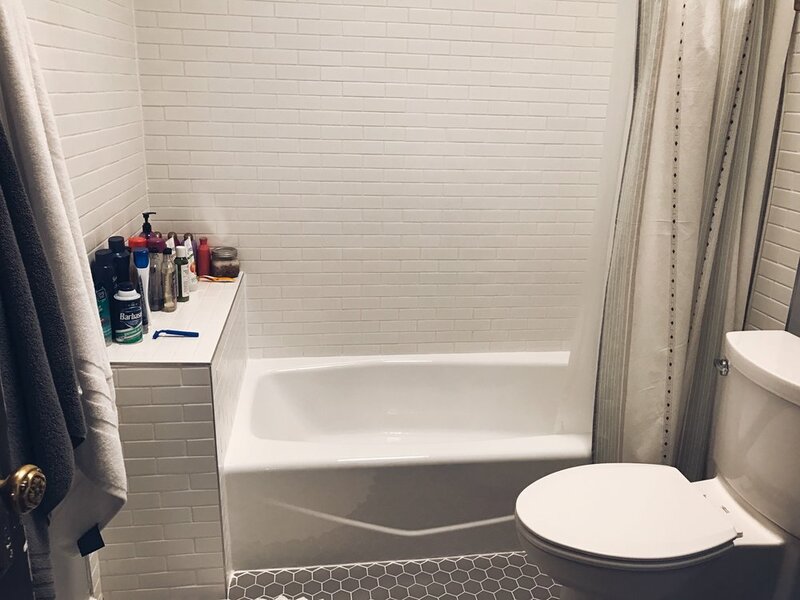 I am so excited to share our before + afters of our bathroom renovation! I will share more details on how it all happened in the future but it is fun to just share the transformation at this point! The functionality improvement is so noticeable and has really improved our daily life in a small space. This is our only bathroom in the house so its an important one! Something about the brown floors were just so dingy. Also in a tiny house you need vanity storage. period. This pedestal sink just wasn't cutting it. We went with a Home Decorator's simple grey vanity with plenty of storage. I am so happy about this! I will take pictures soon of my linen closet. It just freed up so much room & improved how we get ready in the morning. Also toilet paper is now in the actual bathroom! We switched the location of the toilet and vanity so that it was a more normal layout. Before we just had a huge mirror that covered the entire wall and a light fixture that was really close to eye level and it was also rusting. Also we had beatboard with a ledge that we ended up using to set all of our bathroom junk on. I love how simple the vanity area is now. We have a place for all our bathroom things and we can easily get ready and then put everything away in the vanity. I prefer to have nothing on my counters. The new light fixture is at a more appropriate height and brightens up the whole bathroom. This medicine cabinet was above our toilet before and it was really inconvenient. Frequently things would fall out and fall into the toilet, GROSS! We made the unusual decision to just get rid of it and dry wall over the hole. I still stand by this decision 100%. My husband and I have never been huge medicine cabinet people so it is not missed at all. After removing the medicine cabinet, we had free wall space to FINALLY hang a hand towel! Previously, when we first moved in we had a hand towel rod and I am not even kidding the first day we lived here I tried to wipe my hands and the whole thing just broke off and that was the end of that. This has been so convenient and I love that we were able to use this space efficiently. Since we decided to go with a more normal mirror size, we gained enough space to do over the toilet storage. This is prime real estate in a small house! We decided to go with open shelving that were both functional and cute. Let's be real, I like the cuteness. I use the cotton squares to remove my eye makeup and the cotton swabs daily so having them in a functional place has been really nice! I feel so weird putting pics up of my toilet but oh well. So this toilet had PROBLEMS! First you had to pull the handle towards you to flush which is backwards. Also it would get stuck when people flushed and would run the whole time until you jiggled it. It was so annoying! Ahh I am obsessed with this toilet! Is that weird? It is elongated and sleek. I specifically really wanted NO piping to be showing and the smooth surface to the floor for easy cleaning and not letting gunk get on there like dog hair and other unmentionables. Anyways, I could not be more happy about this purchase! See there is no piping showing on the side? It is so easy to clean! The other reason we moved the toilet and vanity is that previously if you were using the restroom and didn't shut the door then people walking on the sidewalk or that came up to the front door could just see you. Probably TMI but this has been really nice to have these switched. As this picture shows, this shower head would frequently turn in all different directions and wouldn't stay in one position while you were showering. This probably contributed to the mold below and also led to some funny stories of people showering at our house and accidentally spraying the whole bathroom with water. My husband and I love rain shower heads but we didn't want to re-route plumbing through the ceiling so this was a great compromise. We LOVE this big shower head. We also moved it up about 6 inches so that it would be at a better height. We also decided to tile all the way to ceiling which has turned out to be one of our best design decisions. It makes the space look bigger. We also decided to go with a slightly smaller subway tile with a matte finish that coordinates with our flooring tile. Subway tile just looked too shiny next to the flooring. See mold in picture above corner and around the edges. YUCK. Also you couldn't have taken a bath even if you wanted to because we had no stopper! There was some water corrosion around all the fixtures and we had some hot water problems due to the old galvanized piping. We replaced all galvanized piping that related to the bathroom so that has made a huge difference! We love the new fixtures and bathtub! They are just clean and new and work like they should. We went with a Kohler simple cast iron tub and its awesome. Our contractor also did a lot of work in the corner of the tub to try to prevent future mold issues, which we are really thankful for! We had a shelf in our shower and it had two ledges which seemed odd to us. We didn't expect that there would be any piping behind there since the other side of this wall is our closet. When we opened the wall, there was nothing else there! They just framed it weird. We love this slightly bigger shower shelf. 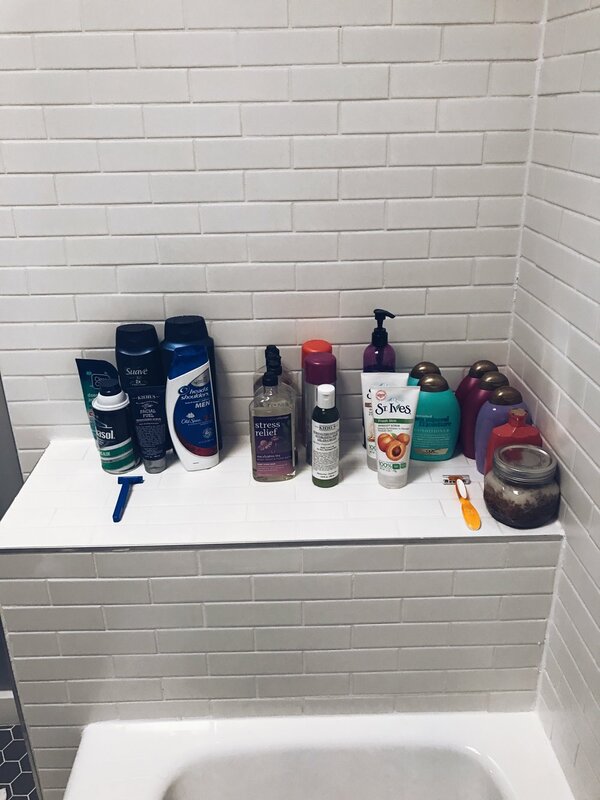 It is so convenient for all our bathroom items and our contractor even angled it slightly so water runs back into the shower instead of sitting there and creating mold issues. We had bulky rugs previously that covered a lot of the brown flooring. We kept our same shower curtain since i had just bought it a few months prior and got a simple round white rug from World Market. The mid-century modern hexagon tile is so smooth and nice. My husband is not a huge fan of the tiny white hexagon tile that most people put in old homes but I still really liked hexagon tile. We love this tile and get so many compliments from friends. Thanks for stopping by to check out our renovation before + afters! This project went SO smoothly compared to our kitchen renovation. It was only 8 business days and they were completely done. We loved our contractor! 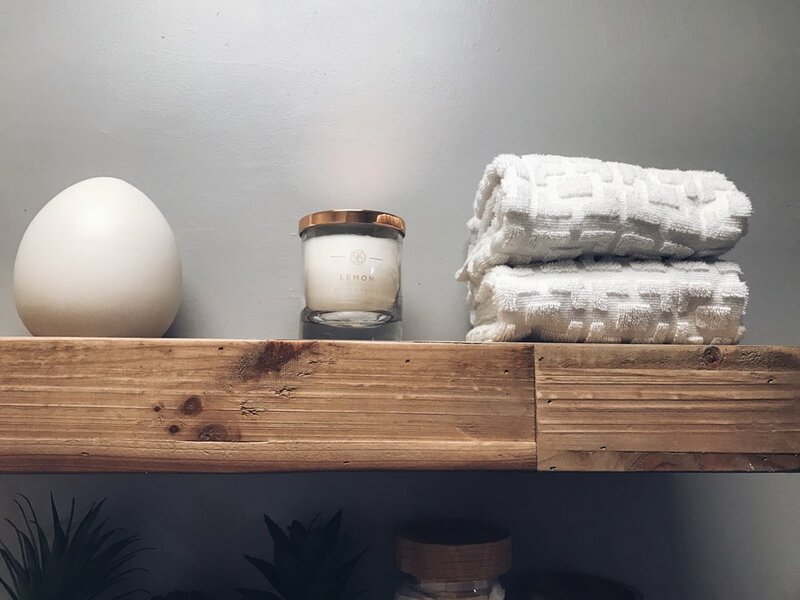 When I first started this post, we were starting our bathroom renovation the next week, then life happened and managing a renovation the week of the Women's Retreat I have been planning for 9 months just made things crazier so I never actually published! Anyways - back again to give all the details. It was a process to get 4-5 quotes over the last few months with all of our travel and hosting family in March, work out the details with the contractor we chose, and ultimately decide we were going to move forward with the project from a financial perspective (renos ain't cheap, let me tell ya!). We ended up using a contractor that came highly recommended to us through a friend of a friend. I always love using someone that someone we personally have a connection to used because it just gives an extra level of comfort that the project will be done well and that they won't do something shady like take your money and run. There are some crazy contractor stories in Denver due to the current housing market and large number of old homes. We decided to do a full gut of the bathroom and despite the title of DIY Series, we are not doing anything ourselves. We only have one bathroom in our house so time is of the essence in this case. Our contractor promised that the entire bathroom would be done in one week and I am pleased to report it took 8 week days and that is pretty amazing. We also host people in our home at least twice a week so we just really wanted this done quickly and all put back together as soon as possible. My mom also came to visit Mother's Day weekend so that was pretty much our deadline. Our inspiration for this bathroom is fresh and clean. Our bathroom is pretty small (about 10 by 7 feet in total including the bathtub) so we just wanted it to be functional and clean. The previous owner(s) renovated this bathroom several years ago and there are so many weird things about it. The beat board is damaged and drips of paint are visible. There were areas with caulking covering up holes in the wall. Also the light fixture is rusting. Again it is just a MESS. There was even some mold peaking through the corner of the bathtub that they previously tried to cover up with more caulking before we moved in. We absolutely love the feel and look of the Moen faucet we purchased for our kitchen so we decided to go with all Moen brushed nickel fixtures in the bathroom. They are just so smooth and a really good quality. We were also confident that all of the fixtures would match if we stuck with one brand. Since we have moved into this house we have had heating and air condition problems. It is a 1910 home and we are lucky to even have HVAC in Denver. Most friends do not have this luxury. We have no insulation in our house. Like zero. Behind this plaster is brick.. well hopefully (wink wink). In one instance, we removed the baseboard to the left of the door and we were able to see straight outside. This was also the case next to the pantry. (No wonder there was once a mouse problem...) Our food would be COLD, like icicle cold, in the winter in our old pantry. We wanted to get this door and door jam repaired since it is original to our home but unfortunately the door was just too warped. Look at the top left corner of the door. It was bowing out significantly and we were able to literally see outside at all times. This created a bug problem and also our house was losing air quickly. Throughout the last 100 years or so, this door faced the elements and the storm door was offering little to no protection at this point. So it was concluded we needed to replace the original back door (cue Nicole Curtis yelling at me...) and my dad graciously gifted us a new storm door & installation for a house warming present. Funny story: When we first bought our house my step mom came in town to help us with a few projects. When she first got here we went to Home Depot to purchase supplies for the weekend projects and I was asking Ben for a new storm door because the one originally at the house would slam shut so loud and it actually ripped several pieces of clothing because it was broken. This was week 2 of owning our first home and Ben was like "No! We can't spend all our money right now!" haha soo my step mom told my dad this story when she got home because real adult life set in for us. Since that day my dad has been set on gifting us a storm door! Here is a before shot from inside our kitchen. Looking back on it, the door was rough. I really wanted to keep the integrity of the home and this meant ordering a custom wood door. We went to The Door Store in Denver and their prices were really reasonable (actually WAY cheaper than Home Depot) and they had a style that was really close to our original door. The only detail we lost was the look of the 4 windows. I truly like the all glass because again it lets in more light and I can look outside unobstructed. This is the day our contractor installed the new door! I will get into a few other problems we had with the door that are common with old homes and shows you just how much craftsmanship went into this from our contractor. You can see above that the concrete slab under the door was crumbling. Also the deck is right up against the doorway so this causes water to pool up against the house. In addition, the wood around the transom was rotted. Basically we needed help. Our contractor suggested that he could add concrete to stabilize the door below the new threshold, he could add another picture window in front of the original transom to increase energy efficiency and he could install some decking to redirect water away from our house. No sooner than he discussed this with us, we had a major rain and hail storm in Denver. The water came pouring in our kitchen on the newly finished hardwood floors. We had cardboard all over the floors to protect them and the water soaked underneath and to top it all off our floors are of course uneven so we were in a scramble to clean up all the water in the kitchen. Thankfully we were home and heard the water gushing in so we were able to act fast. Once we thought that we had averted this crisis, we went to the basement and there was water everywhere in our office. Oh joy. So we decided we should proceed with making some additional repairs to this back door area to reduce the risk of future water issues. We absolutely do not regret this add on to our project. After we painted the door, our contractor installed our new storm door! Isn't it beautiful? It has a feature where you can pull down the glass halfway and it turns into a screen. This is so nice to have in Denver. I pretty much leave the back door open all the time now! You can also see the new grey decking that diverts water and snow from the doorway. After installation of the door, this is what the inside looked like. I was insistent that we keep the original molding around the door so it looked quite rough right after installation. We caulked and painted all the molding and it changed the look of this door dramatically. I was also insistent that we keep the original door handle. However, the latch was very old and a weird shape so we found an online shop that sells antique hardware parts that would allow us to still use our doorknob but were smaller in overall size so wouldn't threaten the integrity of the new door. Door knobs are so complicated! The metal stick that actually turns the door open is a 5/16" square pole. This is not the standard anymore. But luckily for about $25 we were able to order a new inside piece from House of Antique Hardware. I learned a lot about door handles and latches through this process. We specifically ordered this one. This website has tons of great info and I went to the glossary often to determine exactly what we needed and called their customer service #. They were great to work with! Below is an in progress shot of the finishing details. Again it is so amazing what a fresh coat of paint can do for your space! Cheapest way to freshen it up! Buying a traditional wood back door from the Door Store and painting it a fun color! We didn't lose the charm of the old house. Putting a fresh coat of white paint on all the trim around the door and in the kitchen to really clean it up! Adding a fun and eclectic rug from West Elm! P.S. Sorry you can see me in the reflection in ALL of these pictures haha. We are wrapping up the final details of our kitchen renovation. Before we show the big reveal, I thought it would be fun to reminisce on where we came from. Kitchen sink area from when we were first looking at the property. Aren't those staged decorations just so lovely? haha I dont miss that dishwasher, at all. The kitchen sink area right before we started the renovation. What you can't see is our new dishwasher we bought when we first purchased our home. Okay lets get real... Who designs a kitchen where the sink is off center from the window... and to go ahead and top it off they move the light fixture over to be directly above the sink? This was easily my least favorite part of this kitchen was this whole area. The tile went partially onto the actual window. It was dim and yellowy and this faucet spewed everywhere from the faucet head when you turned it on. This tile was a PAIN to clean and it just looked really dingy. The stove area from when we were first looking at the property. That stove.. yuck yuck. Stove area before we started the renovation. Do you notice how the back of the stove is higher than the wall? The fridge area when we were first looking at the property. The fridge was TINY!!! Our pantry... There is nothing Texas sized about this pantry. You know how people in Texas have WALK IN PANTRIES?! Yeah that's a thing. Not in Denver but else where. I could fit approximately 1 bag of chips and 1 box of crackers in this pantry previously. LOL joke but it was small. Below is this weird pony wall in the kitchen. To the left of the pony wall is the staircase to our basement. At one point when they made this open concept this was their solution so the stove didn't just fall into the stairase. I am thankful for an open concept in this tiny house nonetheless. Our house was renovated by the previous owner at some point before it became a full-time rental and he removed all the other walls upstairs except for the one into the kitchen and this little pony wall. This one wall that is sticking out totally closed off the kitchen. The backdoor area when we were first looking at the property. The back door area right before we started the renovation. Ahh... Those dingy floors. Make me cringe thinking about their unsanitary-ness. I spent hours cleaning them to no avail. Our entire kitchen was packed up and sitting in these tubs for about 8 weeks. Looking back this renovation stretched us in so many ways but I am really, really thankful for the final product! Can't wait to share it with y'all. This home is such a blessing to us and we constantly praise the One who hand picked it out for us!